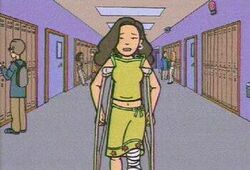 "Fat Like Me" was the third episode of the fifth season of Daria. It first aired on MTV on March 5, 2001. "Fat Like Me" was written by Peggy Nicoll. At Sandi's house, the Fashion Club is reviewing guidelines for new membership, and among the changes is a reduction in the maximum allowable weight -- a change that Sandi, as usual, forces the others to accept. Sandi suddenly falls victim to the antics of her brothers Sam and Chris, whose argument over a toy truck's remote control causes her to fall down the stairs and break her leg. Quinn is upset about Sandi's predicament yet tries to keep the club going, but Stacy and Tiffany don't mind Sandi's absence and are quite happy to have a new boss. Weeks later, at school, Quinn sees Sandi hobbling down the hallway on crutches... and quite a few pounds heavier. Quinn, Stacy and Tiffany try to cover up their shock, but when Quinn tries to show the Three J's that Sandi has returned, it's too much for her; Sandi rushes out of the school, panting and wheezing because she's now out of shape. A tearful Sandi tells Quinn that she's going to honor the Fashion Club's weight requirements and resign the presidency, but to prevent Quinn from taking over, she guilt-trips Quinn into resigning as well. Upon hearing the news, Daria and Jane -- who've been making friendly wagers over everything from candy to the antics of Kevin and Mr. DeMartino -- make a bet to see whether the Fashion Club will survive without their two leaders. Stacy and Tiffany try to go it alone, but it soon becomes obvious that they need Quinn and Sandi to survive. Unfortunately, they're stuck, as Quinn refuses to betray her word to Sandi (after Jane secretly guilt-trips her) and Sandi obviously isn't going to come back as long as she's overweight. They try everything they can -- even attempting to trick the Three J's into joining -- but Stacy eventually gets fed up with Tiffany's self-absorption and total apathy, blows up at her, and quits. It looks like Jane has won the bet, but it's not to be: Daria was able to manipulate Quinn into helping Sandi lose weight, by hinting that Sandi's unpopularity might make Quinn unpopular. After weeks of Quinn's rigid exercise regimen, Sandi now returns, thin as she was before she left. Confusing the matter further, the previous episode took place in November and the one before that in January. Sandi is also said to have been away from school for "weeks". The roles of Daria and Jane in this episode are interesting and unique. Through each actively attempting to win a series of wagers with one another regarding the fate of the Fashion Club, the duo pulls the strings on much of the action without actually being part of it. The title of this episode is taken from the nonfiction book Black Like Me by John Howard Griffin. Quinn mentions with horror the idea of the unseen Gina and Heidi being in the Fashion Club - both appear in Roentgen's "Revenge of the Attack", forming a rival group with Brooke. Kristen Bealer's "Out of Fashion" depicts what happens if the Club doesn't reform at the end of this episode. This page was last edited on 27 May 2018, at 15:24.